Feb. 3 at the museum, located upstairs in the Durango Arts Center. From left, Jacynda Martinez, 6, Zararose Brown, 5, and Jade Robbins, 6, helped prepare the dish. Six small children stare as their cooking teacher, Yucky Salad, enters the room. She wears an apron, poofy chef's hat and dark sunglasses, and speaks with a silly Brooklyn accent. "What's your favorite food?" she asks the children. One boy pipes up: "Pizza!" Clearly, Yucky Salad has work to do. 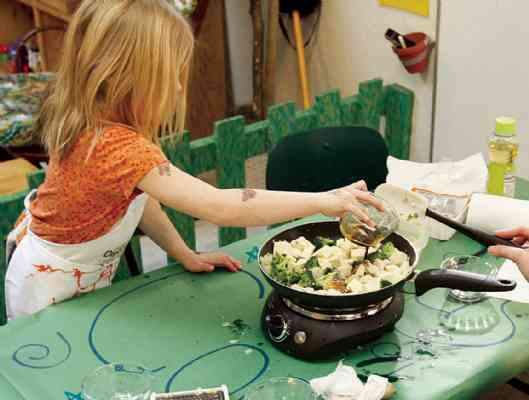 The "Kids Cook" class, held Tuesdays through February, is a program of Durango Discovery Kids, formerly known as the Children's Museum of Durango. The goal of the class, said museum Manager Ashley Hein, is to learn cooking basics by exploring a different country's food each week. "We're going to go to Italy, China and Mexico in this class," said Hein (aka Yucky Salad) to six students Feb. 3. "And we're going to make a dish from each country." The first class started in the U.S. with a classic snack food: pepperoni pizzas with an English-muffin base. Hein provided the ingredients and let the children, ranging in age from 5 to 8, get creative and messy. "America is this place where everyone is different. It's a melting pot," Hein said to the students. "Because this is your pizza, we will make a recipe out of your ideas." One child layered pepperoni in high towers, while another chose to make a cheese sandwich. The students were intent on the work and proud of their finished products, which Hein baked in a toaster oven. Hein packed a lot of information into an hour-long class, including discussions on hygiene, the food pyramid, cleanup and table manners. "Before you eat a meal, you should give thanks," Hein said to the class. "You could thank the person who made it. Or you could thank the Earth, the plants or even the cows that made the cheese." In the second class Feb. 10, the children learned about Japanese culture and customs. They sat in traditional Japanese posture and discussed the history and origin of tofu. 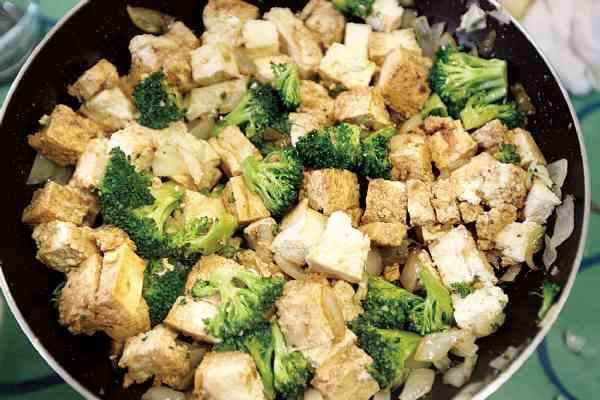 As a courtesy, all the children were required to take a "no thank you bite" of the finished tofu stir-fry. One student said it was "yucky," but others were surprised that they liked the taste. "Kids are more likely to try something if they made it," said Hein after the class. She said part of the fun is allowing children free rein to mix ingredients in different combinations. In last year's class, this resulted in some unique creations, such as a sauerkraut and ham salad with grapes. "It was surprisingly good," said Hein. She is putting together a cookbook of kid-friendly recipes inspired by the class and local chefs. It will be for sale at the Taste of Durango event in May. Hein, who is the mother of a toddler and a former preschool teacher at Durango Early Learning Center, said the Yucky Salad character originated from her work as a nanny and drama teacher. A "very picky" child wouldn't eat. So Hein put on a costume, adopted an accent and began decorating the girl's food and arranging it into smiley faces. The girl named the character Yucky Salad, and the tactics worked to get her to eat healthy food. "I love cooking and sharing things with children," said Hein. "It's a skill to instill early on. It's important that they know how to feed themselves." Hein said it's never too early to introduce kids to cooking. Her son, Bergen, is 18 months old, and she lets him "help" as often as possible. "He stirs things, he smells things, and he likes to listen to the sizzle in the pan. I know it sounds silly because he is so young, but he enjoys it." Hein offers simple advice to parents who want to teach their kids to cook. "There's a lot that they can do Let them get in there and try." 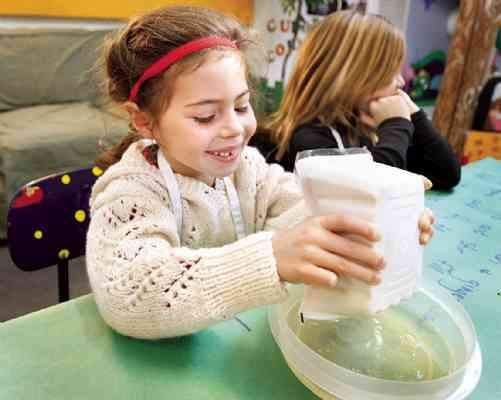 The Children’s Museum of Durango officially merged with Durango Discovery Museum in January. The children’s physical play space, located upstairs at the Durango Arts Center, and the roster of classes and activities is now a program of the Durango Discovery Museum that has been renamed Durango Discovery Kids. DDK Museum Manager Ashley Hein, who was promoted in June, said Durango Discovery Kids will eventually be housed in the DDM historic Powerhouse on Camino Del Rio. She said DDM intends to start interior work on the Powerhouse this year, including plumbing and heating. "The future space will allow us to increase our programs and class sizes, and be open seven days a week." For more information, visit www.childsmuseum.org or www.durango discovery.org. - "Kids Cook" for age 5 and up in March on Tuesdays, 3:30 to 4:30 p.m.
- "Sudden Science, Play With Your Food!" for ages 3 and 4 in May, with dates to be determined. 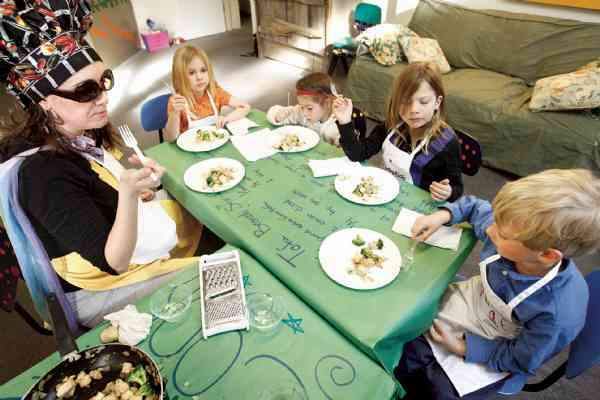 - "Summer Cooking Camp with Yucky Salad: Think Global, Eat Local." Two classes for two age groups (3 to 5 and 6 to 10) on Mondays in June. To register for a class, call 259-9234.